I’m so excited to finally share the front and back covers of our beautiful Christmas catalogue! It has been quite an adventure to get this front shot done and get all the stock arriving in time for our shoot. At some point, I had to come up with a plan B…then a plan C…then everything turned up at the same time and we went back to plan A (I credit Bikram yoga & wine for keeping me fairly sane during these past few weeks) but I’m happy. I’m in love with this Z1 pendant light by Nelson Sepuvelda, who is also the Creative Director behind this beautiful collection of ceramics (displayed on the table) and I loved it so much that I wanted to make it the key piece of our Christmas Home collection. 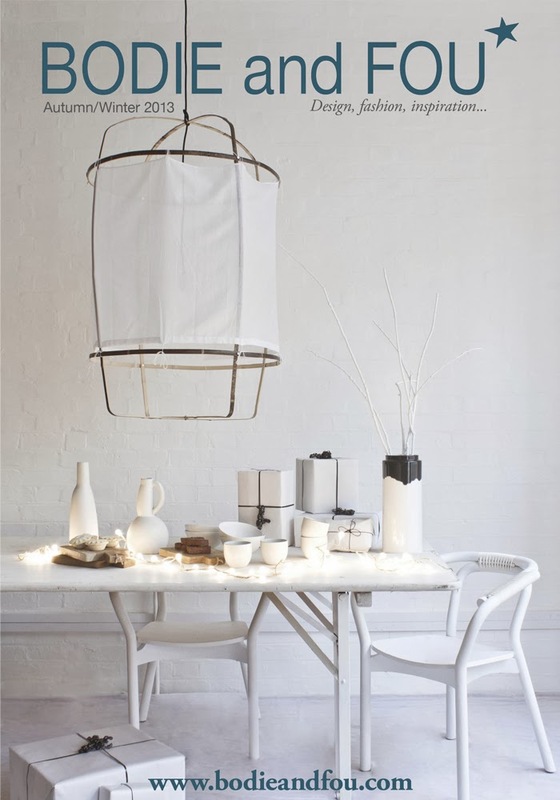 It’s a lamp that exudes style, lightness and was just perfect for the effortless chic, stylish Christmas I had in mind. The two white chairs are the Knot chair (another beautiful piece which we recently supplied to The Hospital Club), the black & white vase is the Agnes vase by Agnes Fries for Normann Copenhagen. On the back cover, I wanted to show you how you could create a nice Christmas decoration at home and if there is one thing you should get this year, is a few of these wonderful paper stars. They make Xmas decoration SO easy! They are light, super easy to put together and you just need a bit of masking tapes to fix them onto the wall or some string to hang them. Polly, my Styling Assistant did the no 25 on the wall using this charcoal masking tape. The wooden star on the pallet is from here, the little porcelaine bear is from here and I’ve just added some of my favourite things…the decorative Mister Hare head, the beautiful handmade dolls by Pigmée, the Bear of a Few Words print and of course, our famous Polar bear family. I really hope you will love both shots as much as we do.